Channel Master has been making state-of-the-art television antennas since 1949. Back in the day, there were many TV antenna manufacturers because over-the-air (OTA) broadcasts were the only means of receiving programs. The advent of cable, satellite, and Internet television has caused a steady decline of OTA users even though most locations still broadcast from towers. It is a shame because aside from the more on-demand aspect of some of those other venues, Channel Master notes: "Live Broadcast Television - It's 80% of what you watch. And it's free." The wireless adoption mantra de jour of "Cut the Cord" can be applied to TV and save you some money if you can do without that other 20%. In this episode, Mac explains the advanced engineering that went into designing the CM Quantum Model 1160 antenna. Fourier transforms and tapered current in the driven and reflector elements were key to the development, along with much empirical testing and adjusting. Most antennas today are designed with sophisticated electromagnetic simulation software that usually result in first-pass success. Optimizer parameters are set for initial configurations and the the computers do the rest. That goes for both electrical and mechanical performance. I don't watch much TV other than an occasional "Walker, Texas Ranger" episode on Grit TV, which is OTA-broadcast on channel 66.002 here in Erie, Pennsylvania. When a notable news event occurs, I'll tune in to JET TV channel 24.001 (I also pick up City TV out of Toronto on channel 31.001). The Able Signal Amplified Digital Outdoor HDTV Antenna I installed a while back does a great job. However, next Spring, if the budget allows, I plan to install a 40-foot tower for a Ham antenna and also put a Channel Master Masterpiece 100 TV / FM radio antenna on it (buy inexpensive RF Cafe software to help finance the project). I'm hoping to maybe pull in some stations from Buffalo, Pittsburgh, and Cleveland. Barney stood in the doorway of the service department staring at Mac, his employer, who was down on his knees on the floor unpacking a carton containing an object that seemed to be mostly gold-colored tubing. "It never fails," Barney sighed resignedly. "We're having a regular blizzard outside, and you're thinking about putting up a new TV antenna. Just once I wish you'd get this urge on a nice balmy summer day. What's wrong with the old antenna?" "Nothing," Mac replied, "but these Quantum antennas by Channel Master represent a new concept in TV antenna design, and I want to see if they're as good at noise reduction as claimed." "How can a TV antenna reduce noise?" Barney scoffed. "That's like saying the windmills make the wind blow." "Not true," Mac denied. "The IEEE defines noise as, 'unwanted disturbances superposed upon a useful signal that tend to obscure its information content.' That's a very broad definition and, as far as TV reception is concerned, includes interference from such diverse sources as electrical ignition systems, all kinds of switches, diathermy, X-ray, electronic ovens, universal motors, CB-amateur-police-taxicab transmitters, FM broadcasts, static, power transmission lines, reflection ghosts, and adjacent and co-channel interference. So an antenna that discriminates strongly between a desired signal off the front and undesired noise off the sides or back can have a marked effect on noise reduction. Such discrimination is achieved by: (1) providing maximum antenna directivity, and (2) minimizing feedline pickup - which, of course, degrades directivity." "You're right about the noise level coming up all the time," Barney said. "We hams will testify to that. And it's getting tougher and tougher to find a relatively quiet location for a radio telescope, like the immense parabolic array at Green Bank, West Virginia. Scientists are already turning to space to escape this 'ether pollution.' Noise is especially bad on channels 2 through 6. That's where you see the most - but not all - of the streaking, the herringbone and moiré patterns, the venetian blind and windshield wiper effects, the shadowy sync bars, etc. This condition is worst in the metropolitan areas, but it is getting worse in the suburban areas, too, as the use of electrical appliances proliferates and factories move out into the suburban and rural areas." "Glad to see you appreciate the problem," Mac commented. "Little can be done if the source of interference is directly in line with the desired signal, but there's at least a 50-50 chance the interference will come in off the sides or back of the antenna. In the case of co-channel or adjacent channel, probably 90% of the undesired signals come in from the rear because of the FCC's channel allocations. The set owner should, therefore, without sacrificing gain, select an antenna designed for high interference rejection. "The Interference Rejection Factor of an antenna is defined as the ratio of the antenna's maximum sensitivity (normally at the front) to its peak sensitivity in the rear 180° sector. Note this is not, necessarily, the same thing as front-to-back ratio. Quite often high gain antennas will have secondary lobes not directly opposite the primary front lobe. Such an antenna may have a very high front-to-back ratio, but the ratio of the front response to the response of say 30° either side of the rear will be much lower. "Up to now, according to Channel Master, the peak IRF of high gain antennas has been 15 to 18 dB. This Quantum Model 1160 I am unpacking is claimed to have an IRF of 35 dB. It is further claimed that, when the predominant interference originates at the rear or sides of the antenna, an improvement of 10 dB in signal-to-noise ratio will occur. This is equivalent to a 10 dB increase in antenna gain. In a deep fringe area the elimination of interference by this high IRF can bring about the same dramatic improvement you'd expect from a higher gain antenna. And in near-fringe suburban areas, where you have enough TV signal but there are lots of interference sources, the high IRF should usually eliminate all signs of interference." "Sounds great, but how do they do it?" Barney said skeptically. Mac had been busy unpacking the antenna and assembling it as he talked. This did not take long because the elements snapped out and the boom sections were fastened together with bolts and wing nuts. "According to Channel Master, the extremely high IRF is achieved by the application of the Fourier Transform Theory to TV antenna design. The way current distributes over the elements of an antenna determines its gain, bandwidth, and pickup patterns. In the past, uniform current distribution has been the key to high broadband gain; but the Transform Theory, widely applied to radio telescopes and space communication, states a tapered, symmetrical distribution of current over an antenna's elements will yield patterns with the smallest side and rear lobes. 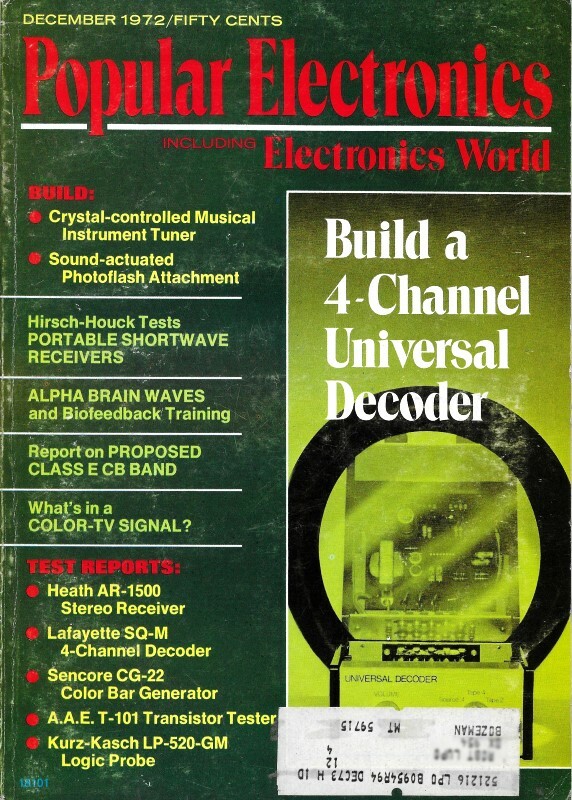 As one CM engineer puts it: 'Just as the amplitude function of a waveform is transformed into the frequency spectrum, so the distribution of current over an antenna array is transformed into the radiation pattern by the Fourier Transform.'" "Until recently almost all work in this connection has been done on broadside arrays of the parabolic and 'bed-spring' types. Very little application has been attempted on end-fire Yagi-style arrays. One reason has been the lack of instrumentation to measure accurately the amplitude and phase differences in the antenna elements. But with the development about five years ago of the Hewlett-Packard Model 8405 Vector Voltmeter, which allows measurement of amplitude and phase differences of two signals up to 1000 MHz, the roadblock was removed. Experimental Development. "Even so, CM spent three years of experimental effort to develop the Quantum line of antennas - work consisting of painstaking adjustment of element configurations, lengths, and spacings, and testing, testing, testing. When you consider that this top-of-the-line Model 1160 has 16 fed elements and 26 parasitic elements and that a change in anyone affects the others, you get some idea of the enormity of the job." "I still am not sure what you mean by 'tapered currents over the antenna elements.' "
"Let me try to explain. First note that this antenna does not consist of a single divided 'driven' element connected to the feed line and a bunch of solid parasitic directors and reflectors. Instead the boom is divided lengthways into an upper and lower section separated by heavy-duty insulating blocks to provide a modified truss construction. Each fed element is cut in two in the middle and has one half connected to the top part of the boom and the other directly beneath to the lower half. Since the feedline is connected to the two parts of the boom, that means all divided elements connect to this line. "Now if we measure the currents in these elements in the presence of a signal, we find not all elements carry significant current at all frequencies. By proper design we can produce currents that gradually increase as we go down the elements and then fall off to produce a curve that satisfies the Fourier Transform Theory. From one channel to another, the peak of this tapered current may fall on different fed elements, but we must maintain the tapered distribution that provides the maximum IRF. You will find more about this in Antennas by J. D. Kraus (McGraw-Hill 1950). And in Microwave Antenna Theory and Design by S. Silver (McGraw-Hill 1950). And when it is crystal clear to you, I wish you'd explain it to me!" "Don't hold your breath," Barney warned, grinning. "I notice you speak of a 'Quantum Line' of antennas. I take it CM makes several using this principle." "That's right. They market fifteen different models designed to fit all receiving conditions from the near suburban to the deepest fringe areas. The set owner can order an antenna fitted to his needs as far as uhf, vhf, and FM reception in his area is concerned - which brings up another point: with FM stations springing up all over the place, FM interference with TV reception is an increasing problem. So the Quantum, designed to furnish excellent FM reception normally, provides for FM trapping if you need it. An optional FM trap that can be installed in the weatherproof terminal housing located between the boom elements gives 20-dB attenuation of FM signals without affecting the IRF of the antenna. Another feature is this front-end section that looks like a sawfish's snout. It's actually a tunable uhf sector adjustable for peak reception of the uhf channels." "How is feedline pickup prevented with this antenna?" "First, the antenna is electrically balanced. By connecting the right-hand sides of the split elements alternately to the top and bottom portions of the boom we achieve transposition in the feed. Also note these controlled-impedance transmission rods that run from the feed points to the weatherproof plastic terminal housing. And see how the boom is insulated from the mast? But even though the antenna itself is carefully balanced, the receiver input may be unbalanced, in which case the feedline will still pick up interference. In that event you may want to employ shielded coaxial cable, and there is an optional balun transformer designed to fit into the terminal housing." "Those engineers seem to have thought of everything," Barney commented. "Well, this antenna is certainly a far cry from the first two-element TV antenna I ever saw. Personally, I'm delighted to see serious engineering going into TV antennas by several manufacturers. Optimum TV reception is impossible without a good antenna. I want to get this antenna up on the roof so we'll have a signal to check on cable performance when we need it. You know how that goes. If we have good reason to suspect the CATV signal is not up to par and call Fred, the manager, he reacts as though you doubted his virtue." "Yeah, I know," Barney agreed with a chuckle. "He is either seeing a perfect picture down there in his office, or something must be wrong with the TV transmitter. Nothing is ever wrong with the cable. He feels so sure of this there is no point in sending a technician out to check. But if we can get a perfect picture off the antenna and a lousy picture off the cable, we can make old Fred sweat." This series of instructive stories was the brainchild of none other than John T. Frye, creator of the Carl and Jerry series that ran in Popular Electronics for many years. 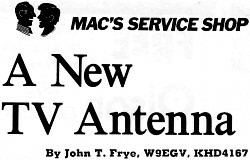 Mac's Radio Service Shop began life in Radio & Television News magazine (which itself started as simply Radio News), and then changed its name to Mac's Service Shop after the magazine became Electronics World. 'Mac' is electronics repair shop owner Mac McGregor, and Barney is his eager, if not somewhat naive, technician assistant. 'Lessons' are taught in story format with dialogs between Mac and Barney.